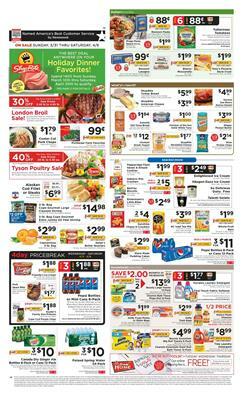 You can find meat, seafood, snacks, and general grocery product deals on Shoprite Weekly Ad. Discounts can be in different forms such as BOGOs, coupons, weekly price drops, etc. Sometimes you can see limited-time offers like 4-day-sale. Occasionally, they offer holiday discounts and give a recommendation on what to cook. Reward system is also a possible profit out of your shopping at Shoprite Ad. Try to lower the costs of all expenses of weekly products like fresh grocery and pantry. Get your favorite snacks at Shoprite but before you do all of these, have a look at the Shoprite Ad to see if something interesting is available for you. Shoprite supermarket has 337 locations in New York, Pennsylvania, Delaware, Maryland, Connecticut. It’s a subsidiary of Retailers’ cooperative. Follow the future deals from this supermarket by a subscription for free. Get newsletter and emails about the posts on weekly ads. 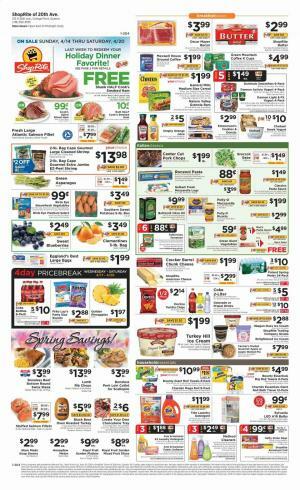 Stock for the holiday dinners and save with the Shoprite deals. The deals of this Ad will be valid until April 6th. Buy London Broil with a 30% cheaper price. Snacks are on sale at Shoprite. Save $1 on Pepperidge Farm sweet & simple cookies. Refresh your body with a quick quench with your favorite soda pack. Great savings are also available for some household items. Save $2 off Bounty large towels 12-pack. 4day price-break deals are Pepsi Bottles or mini cans 6-pack that will cost $1.88. Buy water packs at Shop Rite at cheaper prices. Poland Spring Water 24-pack will cost 3/$10! ShopRite Executive Smoked Turkey Breast $5.99/lb.